We had some leftover decal sheet in the house after we had the idea to adorn our mugs with pictures of our son, so definitely this project was a Go!. We had bought the decal sheet and the decal sheet spray from our local bookstore. If you can't find it in your office supply shop, you can try also your local hobby shop, since model kit builders have long made their own decals to detail their models. The type of decal sheet that we bought was clear since we were planning to use white mugs. There is another type of decal sheet that is colored white so that you can make designs with white in them to make up for the limitation of colored printers that can't print out the color white. The first thing I did was to fire up the old PC and searched for a good image to turn into a decal. 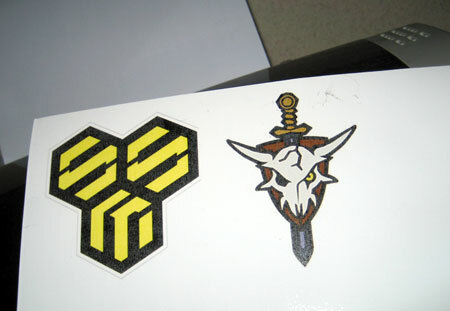 I decided on the SMS logo and the Ozma Lee's Skull Squadron logo. Using an image manipulation software (ex. Adobe Photoshop or GIMP) I adjusted the photo a bit so that it will fit the mug. I'd recommend not resizing your image to a bigger size because it will come out grainy when you print it out. I used an old Epson C45 inkjet printer to print out the design to the glossy side of the decal sheet. I guess almost any printer nowadays can be used for printing images on decal sheets, but I'd recommend a printer that can print photo quality images just to be sure. 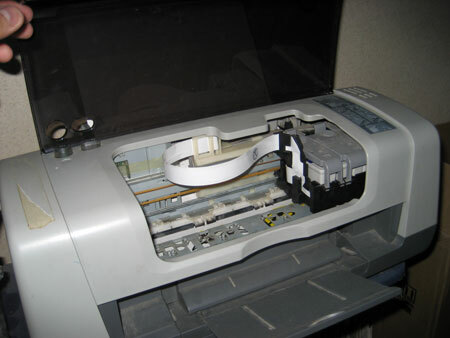 Before printing I had set the printer to print image quality photos (usually this means at a higher DPI). 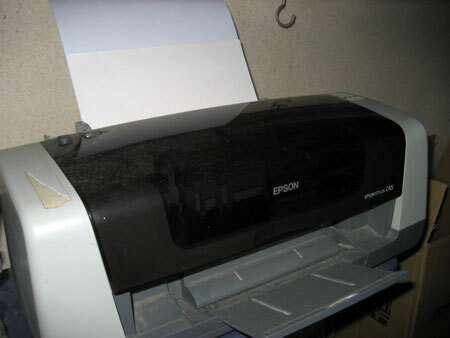 The Epson C45 has the option to print in draft, text, text-image or photo quality. Also before that I had the printer run its head cleaning maintenance program about 3 times before printing on to a test sheet of paper to ensure that the flow of ink is ok. Only when I was sure that everything came out as planned (size, no smudges, no missing lines of color) did I print on the decal sheet. After printing I waited a few minutes to let the ink on the decal sheet dry up totally before touching it. Then I got some scissors and trimmed away the excess paper on the decal sheet, leaving only the design and about 5mm worth of extra space. 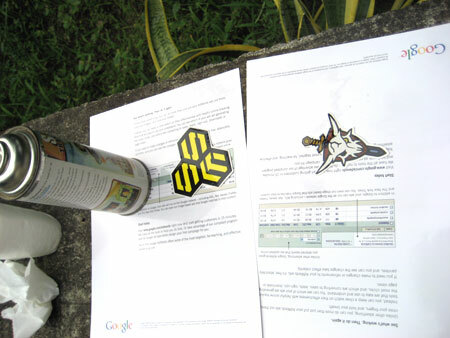 I got the decal sheet spray and sprayed the decal sheet with it. I sprayed it from about 8 inches away in only one direction. Before spraying I fired a couple of shots to clean up any gumming to ensure that the spray volume I got was a fine mist. They call it decal sheet spray but it smells to me like good old clear coat used in model kit building. If I'm correct in my assumption, that it is indeed clear coat, then I guess you can also use good old acrylic liquid floor wax from Johnson & Johnson that modelers use to clear coat their work. Of course spraying it on is much better than using a brush because the protective layer will come out more uniform in height. I allowed that to dry a bit for a few hours before touching it. After waiting a few minutes for the first coat to dry, I add another coat then wait for that to dry and add another coat. 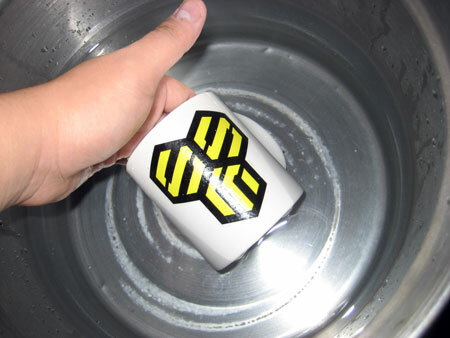 This is to make sure that the layer is thick enough to protect the design because unlike plastic models this cup will be washed often and water entering the decal could cause the ink to run from the design. This is the part where we call it a day and wait for the next day before doing anything else to allow for stuff to dry. 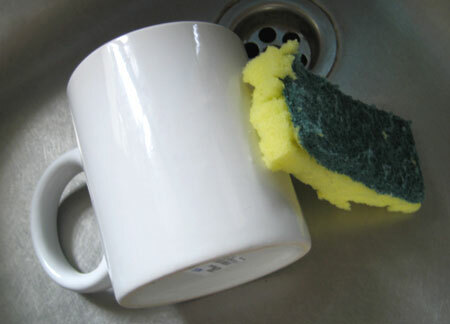 The following day the spare mug that we had in our house was hand washed with liquid dishwashing detergent to remove the dirt amassed from being stored in the cupboard as well as the various oils leftover on the surface. I got a basin big enough to submerge the mug and filled it with water. 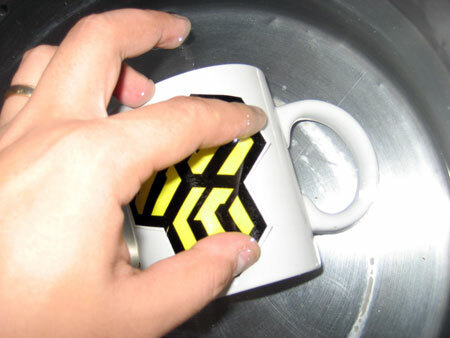 The moment you dip the decal in it will start to curl because its absorbing the water, that's why I try to keep a lot of fingers on the decal during the process. Common practice is to use a container big enough to fit the decal, dip the decal in it, then once its loose from its paper, put it on top of the item then slide the decal off. I prefer however to dip both the mug and the decal sheet in the water because I find it easier to align the decal to the mug that way. 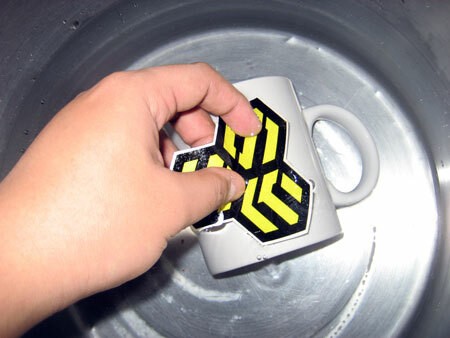 If its submerged and wet it moves easily on the mug for alignment. I pull out the mug from basin to check for any air pockets. If there are I dip it back down into the water and use my fingers to push the air pocket to the edge of the decal so that it can escape. 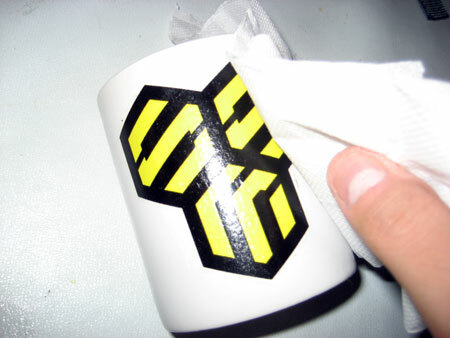 In this step I also work to remove any smudges on the decal. Afterwards I get some soft tissue and wipe out the excess water on the decal gently. Actually its more like dabbing the tissue on the decal instead of wiping it. Afterwards I set it on the desk out of reach of animals and kids to allow it to dry. In the instruction manual of the decal sheet, it is recommended to use either a hair dryer or to bake it in an oven to harden the decal on the sheet. 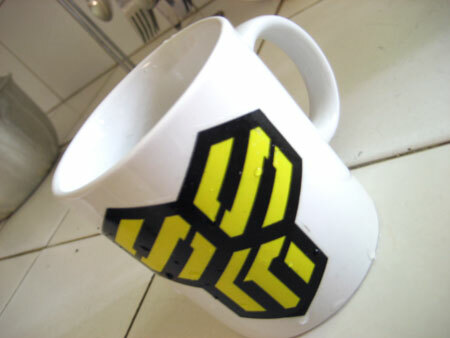 Professionals I know use a heat press machine specifically designed for mugs to press and compact the decal in. A day after, once I'm sure that the decal is dry, I like to use the decal sheet spray to add 3 or more layers of protection on to the decal to protect it from the rigors of washing. Be sure that the decal is really dry before spraying because I made the mistake of spraying the clear coat right away and it curled up the image, blehhhh. And that's about it for this post on making a personalized mug. Oh, I intentionally did not put on the other decal (Ozma Lee Skull Squadron) because I was planning to put that on when I was sure that the first decal and its clear coat had dried already.